Did you know that you have 50% more space than you think you do? Chris Hotze, of Crescere Capital Management, sent us this video showing how they transitioned to a lockbox to save a ton of time. Now that’s Lean thinking! Chris Hotze, of Crescere Capital Management, sent us this video showing how Stacy creating order out of chaos. 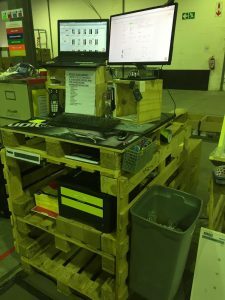 John Montanari, of Kartal Distribution, just joined the Lean Hub and he also sent us this picture of their Lean desk made from pallets. So often companies use “lack of funding” as an excuse. Love how they don’t let that stand in the way! Chris Hotze, of Crescere Capital Management, sent us this video showing how they can easily identify when a file need immediate action. Have you fix what bugs you today? Chris Hotze, of Crescere Capital Management, sent us this video showing his lean thinking behind getting rid of his office chair. He’s a Lean rock star! Nick Fain of MX Trophies sent us their first Lean video. Remember, it doesn’t matter how small, just get started! Printing and signing documents can be time consuming. But watch Robert Olinger cut the waste of 3 minutes 16 seconds for each signature. Paul Akers demonstrates how to use WhatsApp…the cross-platform mobile messaging App. This is a tool they used for the Japan Study Mission. For more information on WhatsApp, go to this link. Paul Akers discusses how he manages his email (up to 300 a day) using the lean technique of one piece flow.